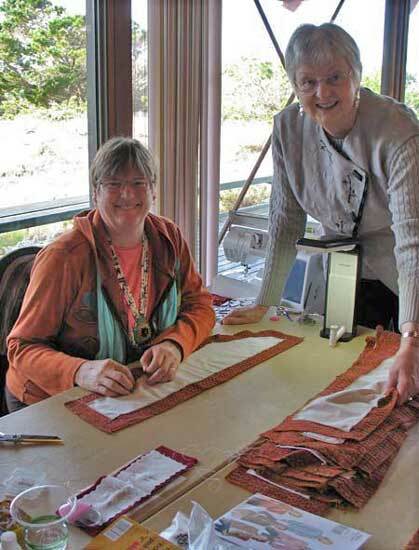 Jane gave students individual sewing lessons covering a wide range of topics and projects. Diana and Susie were sewing couture jackets, Katherine was making a quilt from a family portrait, Ellen was designing a Marfy skirt as part of Jane's Marfy Challenge, Maria was making a leather carrying purse for her dog, Carrie was sewing numerous outfits, Betty worked on a cotton jacket, and Sharon was making a jacket for the cold Wisconsin winters. In between these projects they had time for friendships, shopping, walks on the beach, and "time to smell the roses". 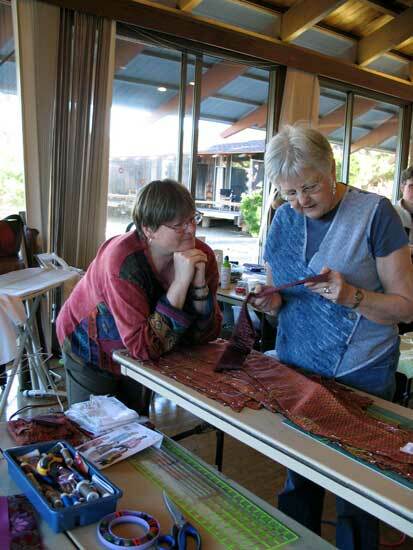 The Sewing Retreat and Vacation was a huge success, and everyone is anxiously awaiting the next event. 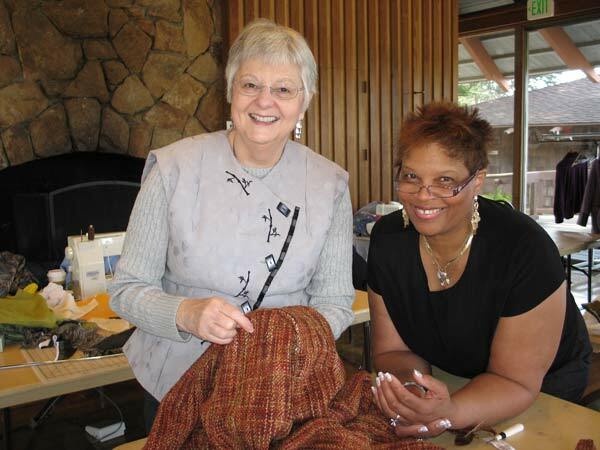 Diana is having Jane teach her the principles of couture sewing. 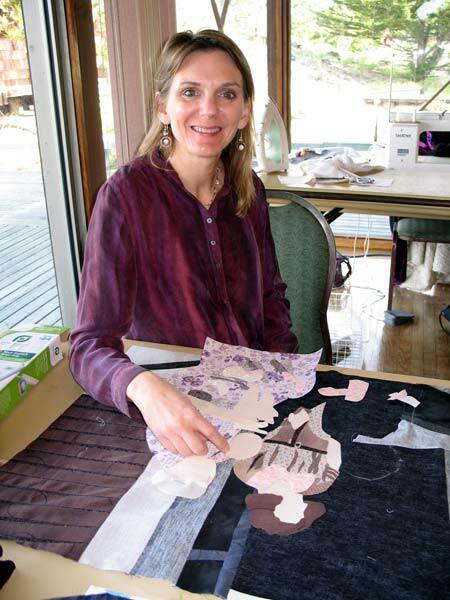 She already had the muslin pattern fitted, and now she is preparing to cut out her couture jacket. She decided to use the less intense side of the fabric as the outer side of her jacket. 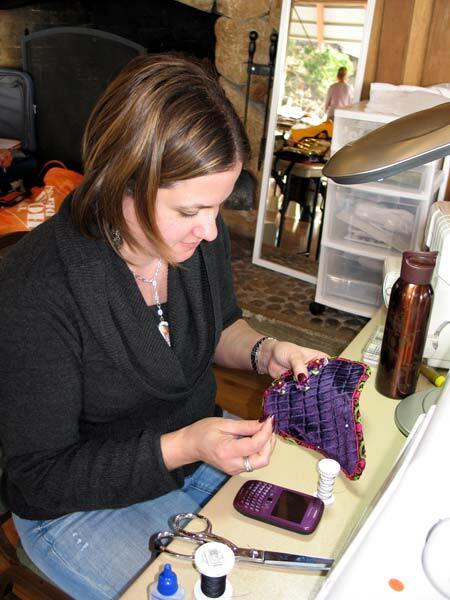 After cutting out the pieces, she is ready to mark the sewing line around each pattern piece. Jane is examining the sample of stitching Diana has prepared, and is recommending the needle size, stitch length, and tension Diana should use for making her garment. Jane also suggests using the walking foot. 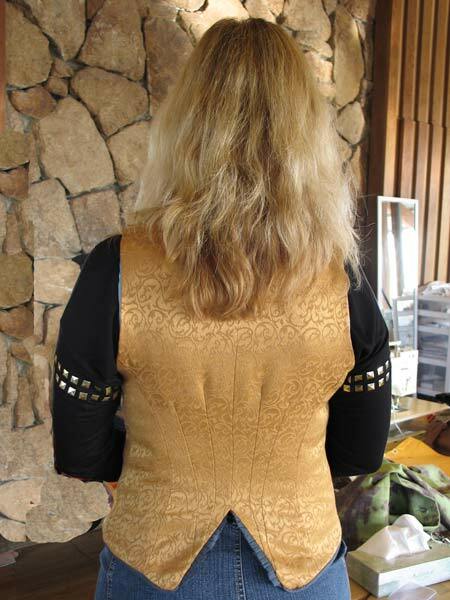 One side of the front half is composed of three pattern pieces, and Diana is having a fitting on this portion of the jacket. 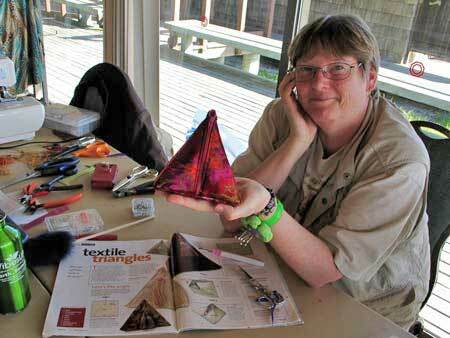 As a little break from the intensity of sewing a couture garment, Diana made this beautiful triangular gift box. The pattern was in Threads Magazine. 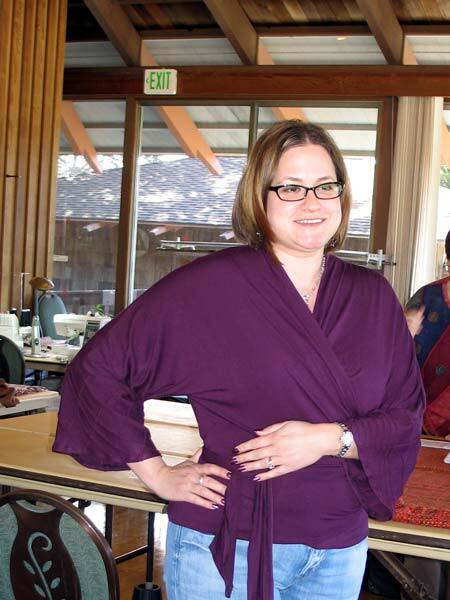 Carrie made a lot of different garments on her Sewing Retreat and Vacation in Monterey Bay, CA. Here she is modeling one of the several tee shirts she created. 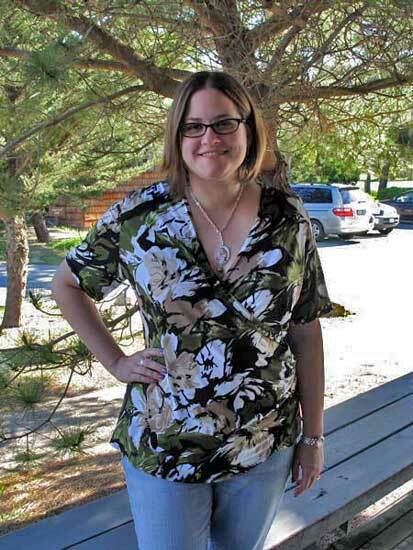 Carrie also made this cross over tee shirt in a great purple. 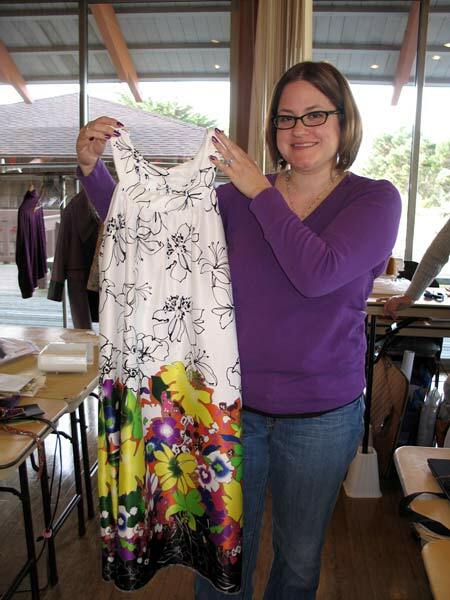 Here is a fun dress she made in only a short bit of time. 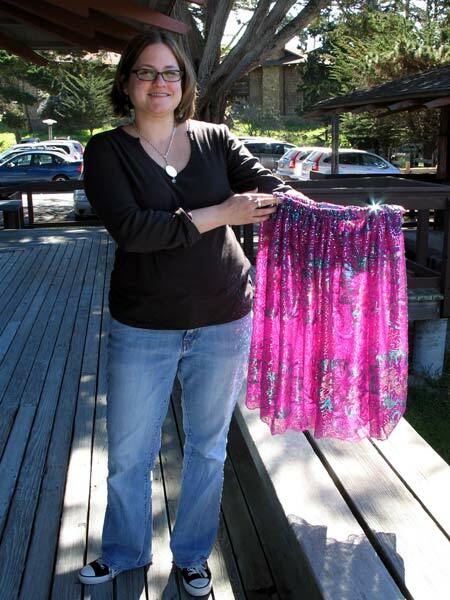 Carries daughter is sure to love this sheer and sparkly skirt. 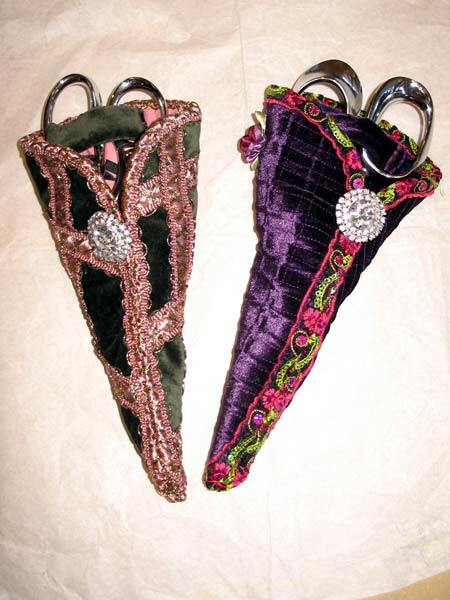 When Carrie's mom saw she was going to make a scissor's case, she requested Carrie make one for her too. 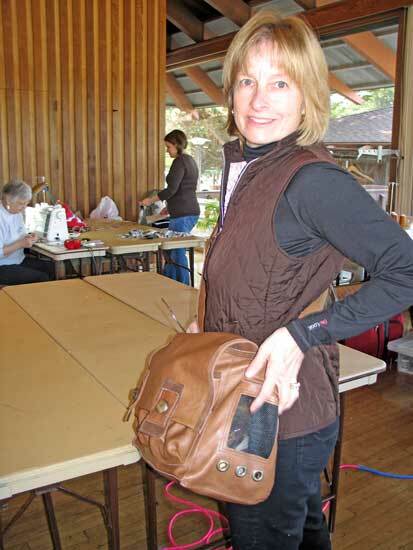 Here are the two scissor cases she made in just a few hours on her Sewing Retreat. The backs of the cases are as beautiful as the fronts. 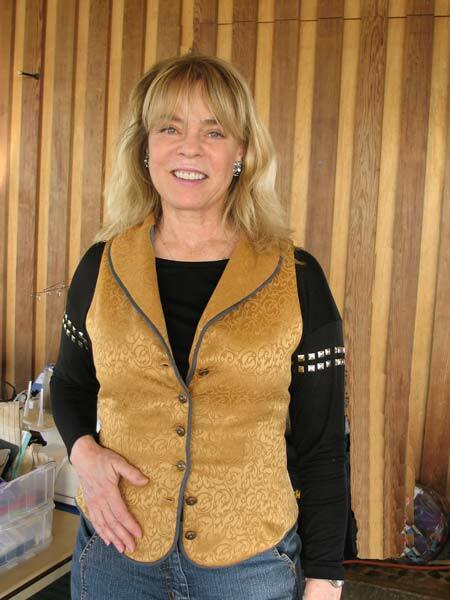 Ellen made this vest with a Marcy Tilton Vogue 8599 pattern, and the detailing is really wonderful. 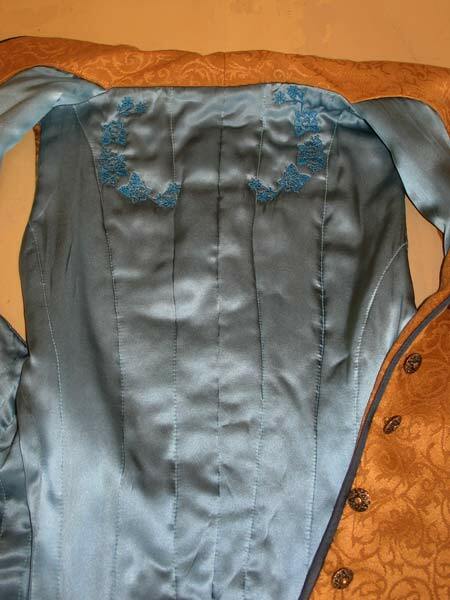 The smoky blue piping and the pleating at the lower V of the vest is fabulous. Ellen embroidered on the lining at the neckline. Ellen laid out the pattern for her new Marfy skirt. A very unusual skirt pattern. 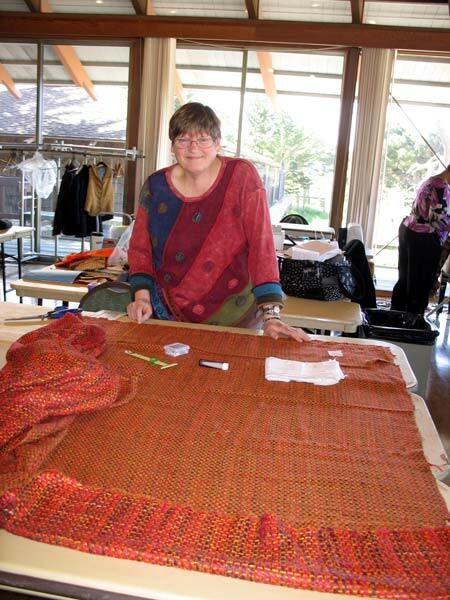 She hopes to have this completed in time to wear to the Marfy Pattern Challenge Jane is having in November. 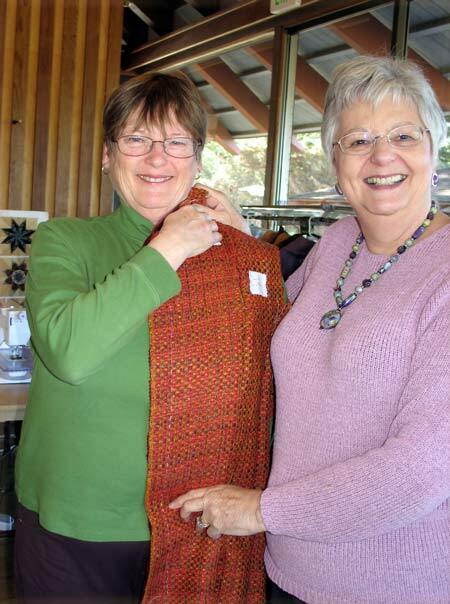 Ellen is showing Betty the Kaffe Fassett fabric she is using to make this quilt. The motifs are all paper pieced. 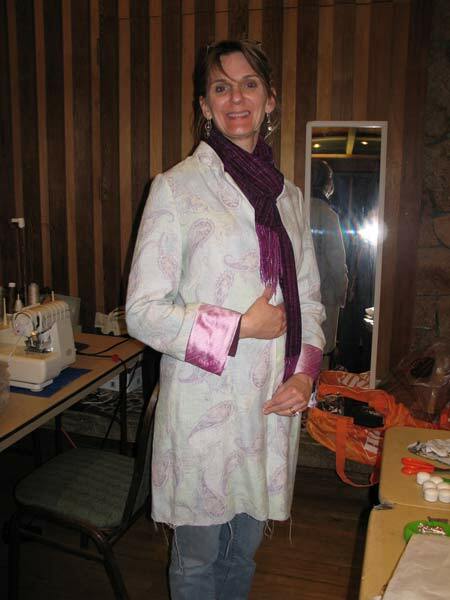 Katherine worked on the next stage of making a coat. 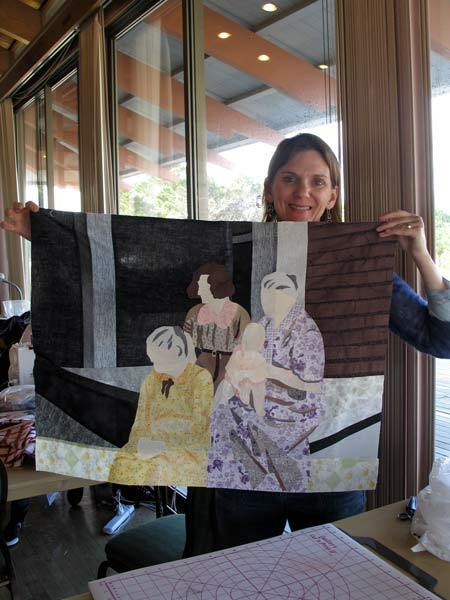 Katherine has wanted to make a quilt from a family photo of 4 generations of women. 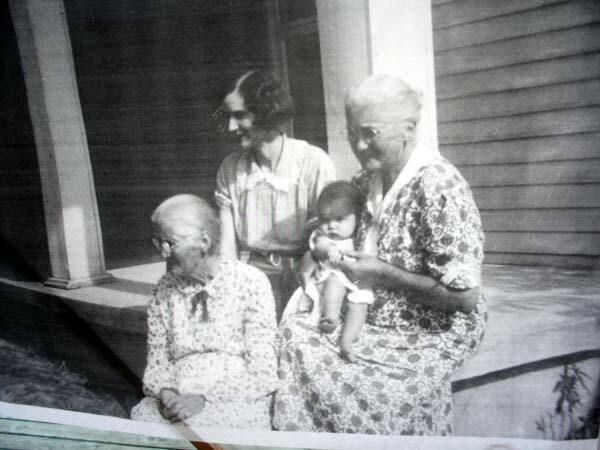 The baby in the photo is her mother, born around 1939. Katherine took the original photo, had it blown up and then copied unto the large sheets of paper shown above. 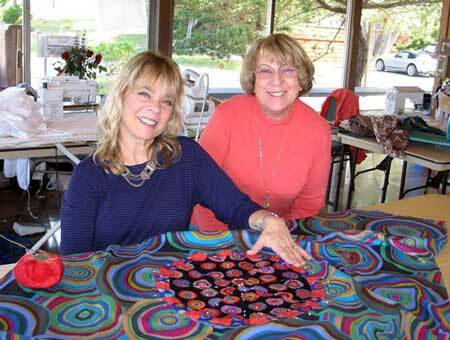 She has been collecting fabric from the 1930's and 1940's era for several years in preparation for making this quilt. 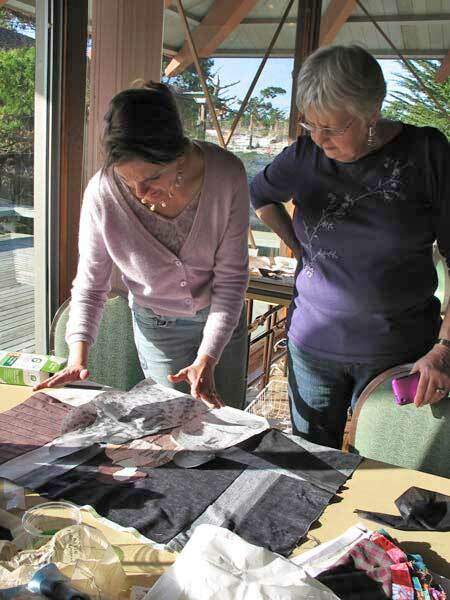 Jane is helping Katherine select fabric for her various pieces, and told Katherine that the value of the fabric (lightness or darkness) was probably more important than the actual color chosen. Katherine cut out images from the paper reproduction of the photo, and then cut out subsections. 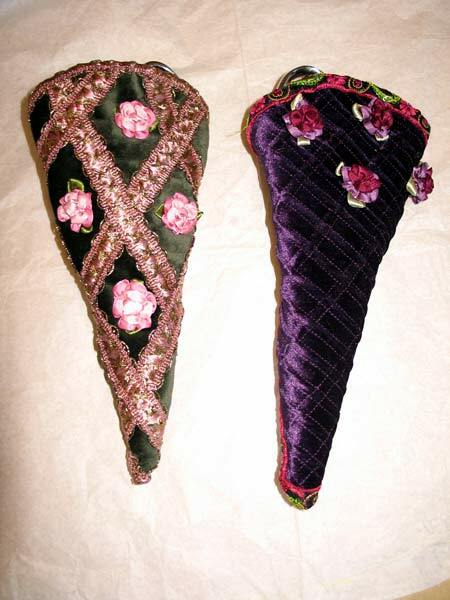 She then cut out the fabrics for these subsections, and is now assembling the figures of the women. Here is the start of the quilt. It was truly amazing. Everyone was overwhelmed by how beautiful it was turning out. It is sure to be cherished by her family. Congrats Katherine! 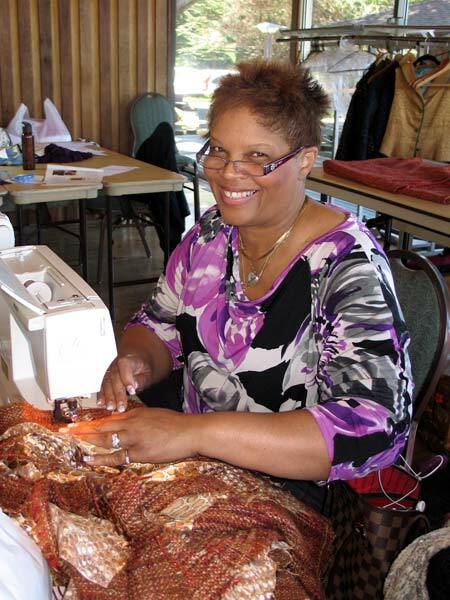 Susie is working on her couture jacket. 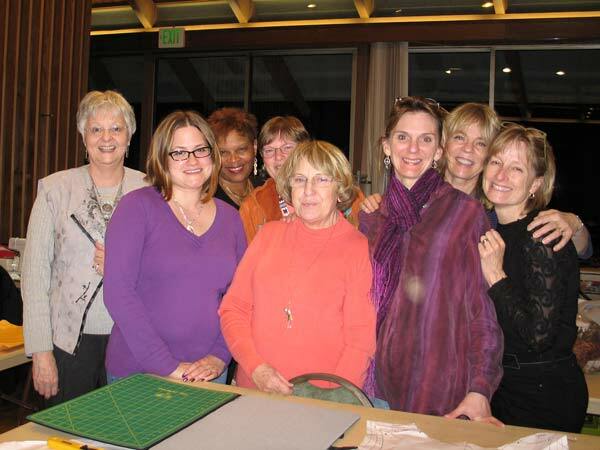 Its great to feel good while you sew, and wonderful to be in the company of fabulous women! 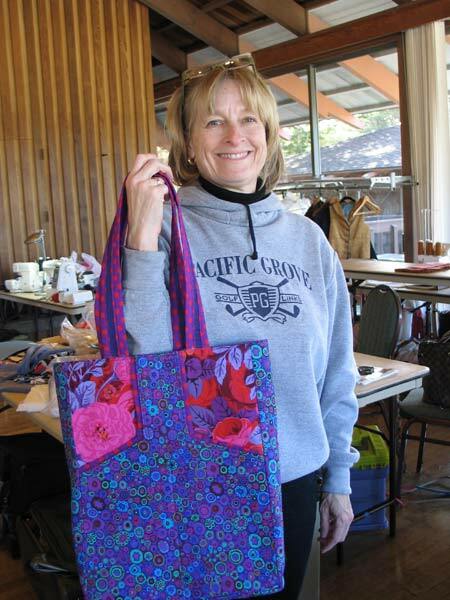 Maria's daughter is off to college in the fall, so Maria made her a colorful book bag. 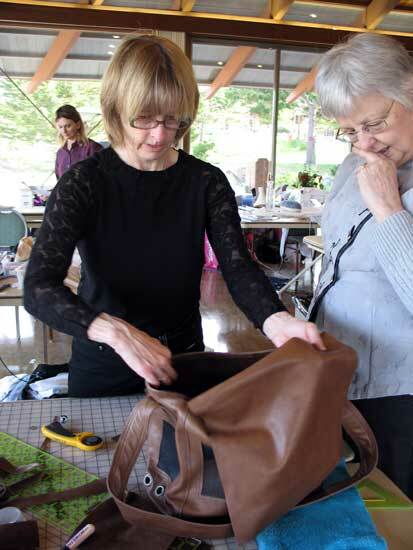 Maria is making this leather bag to carry her tiny dog, and was a bit challenged with the construction details as she did not have a pattern. Note the heavy screening used on the sides for ventilation. The little dog goes everywhere with Maria, and now he will be safe in is own traveling purse.